Please join us at the Augmented World Expo 2013 (Santa Clara, June 4 – 5) for 2 days of workshops, sessions, and networking dedicated to understanding how to drive behavior in consumers, employees and stakeholders. Now in its 4th year, Augmented World Expo (formerly ARE) is assembling the biggest names — from the hottest startups and leading AR providers to the Fortune 500 — to showcase the world’s best augmented experiences that solve real world problems in all aspects of life, from entertainment and brand engagement to enterprise, industrial and commerce applications. It is expected to draw a record number of attendees from all over the world and offer a fantastic opportunity to network, learn, inspire and experience Augmented Humans in an Augmented World. It will exceed your expectations – 93% of 2012 attendees said they will likely return. 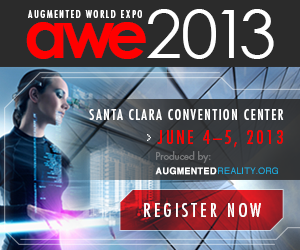 REGISTER NOW (If you register before May 7th, use our discount code AWE2013 for registration) !